Has flowerwork, relatively rare in the NAO brand, which accounts for the high retail price on this item. Estimated value is for flowerwork in pristine condition. 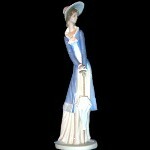 Sculptor: José Puche 1984 $80 $125-$150 Young woman in breeze-swept dress, empire waist, blue with white sleeves, closed umbrella or parasol in right hand; 12 1/2"/32 cm. Also made as Zaphir.